This week I’ve been thinking a lot about what to take to my in-laws’ annual Fourth of July Fireworks party. My in-laws are very easy-going and they keep telling me not to take anything. Being a Southern girl, it’s just not possible to go to a party and not take anything. Ya’ll know what I mean? Since my favorite food group is dessert, it just seems an obvious choice. I want it to be festive so it needs to be red, white and blue, but it also needs to be easy to transport. What better dessert than a berry trifle? This is probably one of the easiest and most delicious recipes I’ve ever made. 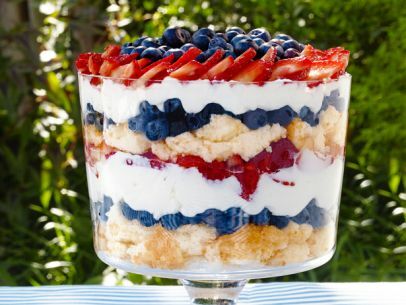 So, if you need to take a dessert to your Independence Day celebration but are scared of the kitchen or don’t have any time, this will be a big win for everyone! This recipe can be as pre-made or as home made as you want. Previous post: So Much More than Fancy Disposable Napkins!